I have this student who has the calmest spirit. I can imagine her getting angry, but I can not imagine her having an outburst. She is the type of student who can email me on Wednesday to read a college essay that is due on Friday or ask me to write a college recommendation that is due the next day. She just has this way with people. Oh, what we will do for children! The class was discussing the idea that all of the books that we read for school are sad or depressing. I thought about that idea. I do agree with them, but most of the sad stories are well written and show the full growth of most of the characters just like life. In life, we have sad and/or bad things happen, but we overcome them. They were not buying this idea at all. So, I asked them to recommend a happy book that is worthy to be studied in school, and I would read the book and consider teaching it. After class one day, the calm spirited student whom I mentioned earlier, told me that she had a happy book that she wanted me to read and consider teaching. I wrote the title down, and I read the book. The book is Peace Like A River by Leif Enger, and I hated every moment of reading this book, literally. As I was reading it, I was emailing her saying "Are you sure that I am reading the right book?" "Do you think that this is a happy book?" And, I talked about her pretty badly in class... I told her and the class that this book made me want to jump out of a window. They got a heart felt laugh out of that. 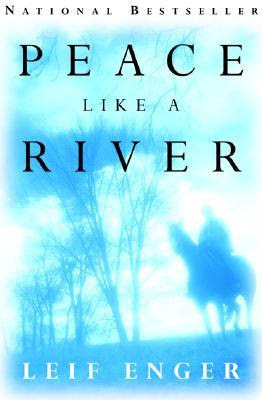 Peace Like a River is told from the perspective of the main character, Reuben Land. Reuben is telling this story as a adult, but he is reflecting back on his childhood and all of the miraculous things that happened. This book has a faith undertone and tries to convey a message about miracles. The Dad performs miracles through Christ and even gives up his life so that Reuben may live. Needless to say, I like books that are thought provoking and that give me with something to think about, and this book did not do that at all...Sorry students, but we still have not found a happy school book yet!